Made of environmental material of breathable mesh fabric, with a good breathable performance. 1. When you apply the carrier by yourself, please make sure the carrier to be safe, adjust the belt length, fasten the lock and push out the carrier from both sides by grasping it with both hands. 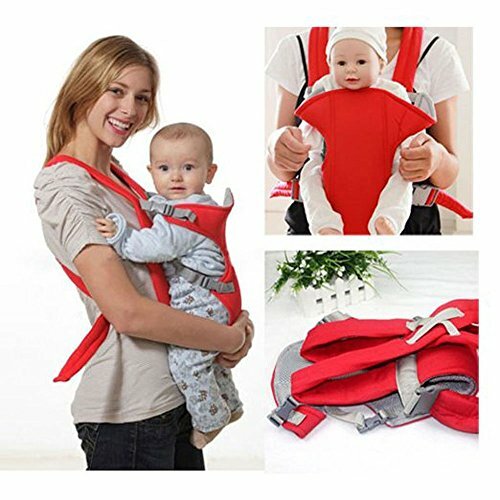 After you ensure that it fastens completely, carry the baby with both hands, place its legs first from upwards into the carrier. Carry the baby at the status of sitting. 2. If there is anybody to help you, so please place the baby in it at first and then carry it. Ask somebody to help you to fasten the lock behind. Anyway, you cannot loose your bands until you are sure that the lock is fastened. 3. It is suitable for the baby of 3-24 months old with the weight not heavy than 12kg.